Following the end of the Second World War in Europe in May 1945, tensions were high between the British Mandate and the Jewish military forces in Palestine. Following a decision by the British government not to allow 100,000 Holocaust survivors to enter Palestine, contrary to a recommendation of the Anglo American Commission, the Palmach, the recruited force of the Haganah, decided to retaliate by shutting down all land connections the British had between Palestine and the neighbouring countries of Lebanon, Syria, Jordan and Egypt. The operation which was officially named Operation Markolet became later known as Night of the Bridges. Thorough and exact planning as well as full coordination was needed in order for this operation to succeed. Scouting sorties were done before the operation to observe and study the area around the bridges and the movement of the British forces. The units which were to take part on the operation were specially trained for it. The operation took place on a bright moonlit summer night on 17 June 1946. One unit was tasked with the mission to blow up two bridges crossing the Achziv stream, one bridge was a railway bridge and the other was a regular road, both close to the Arab village of A-zib. The unit arrived at the railway bridge but was soon discovered by the Arab watchmen who immediately opened fire on the Palmach unit. Under cover of fire the demolition team of the Palmach unit made it to the bridge, a bullet from the Arab force hit the explosives while the Palmach team was under the bridge. 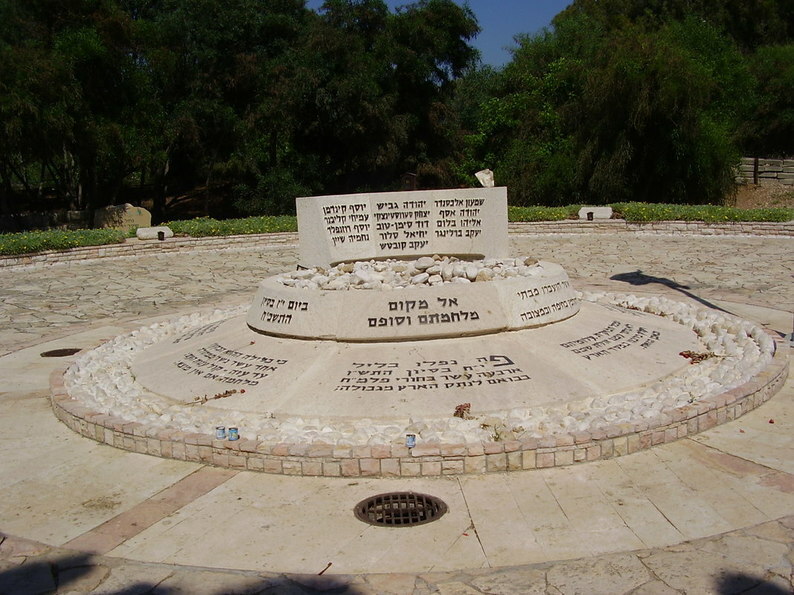 The explosion brought the bridge down, but it also killed the thirteen Palmach soldiers who were close to the explosion. Among the dead was also the operation commander Nehemia Shein. This led to the Palmach force to withdraw before they managed to blow up the road bridge, leaving it the only bridge to survive the operation in the morning after. Other units in the mean while attacked other bridges along the borders of Palestine. Two bridges were destroyed in the vicinity of the small settlement of Metulla, one leading to the Iyon valley which was unguarded and the other leading in the direction of Sidon in Lebanon. The "Daughters of Jacob" bridge crossing the Jordan River south of the Hula basin was one of the main targets of this operation, being the main road used by the British forces to reach Damascus. In order to assure the success of the mission to blow up the "Daughters of Jacob" bridge, a diversion was created in the vicinity of Mount Cana, leading the British forces there and clearing the area of the bridge for the Palmach demolition units to take over the bridge and blow it up. 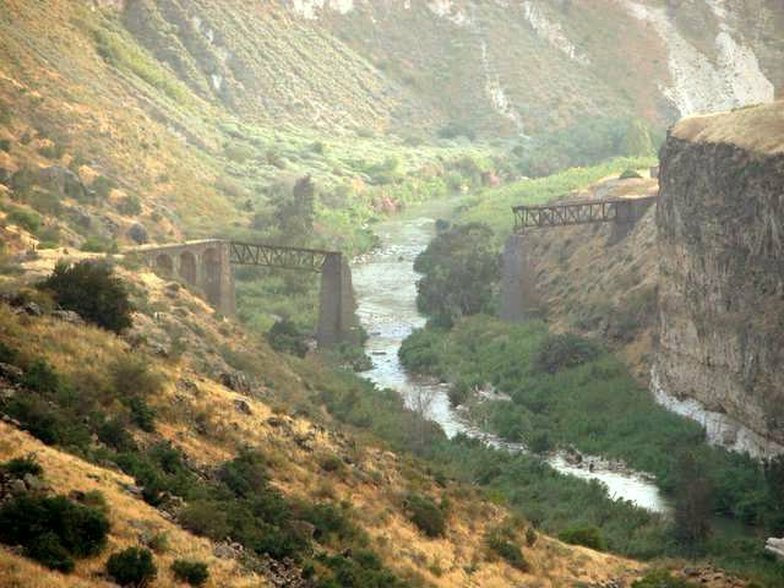 The railway bridge crossing the Yarmouk River in the southern Golan area was found abandoned and blown up without much trouble. Sheikh Hussein Bridge which traversed the Jordan River between the Sea of Galilee and the Dead Sea was also blown up without much trouble. Sheikh Hussein Bridge which traversed the Jordan River between the Sea of Galilee and the Dead Sea was also blown up without much trouble. 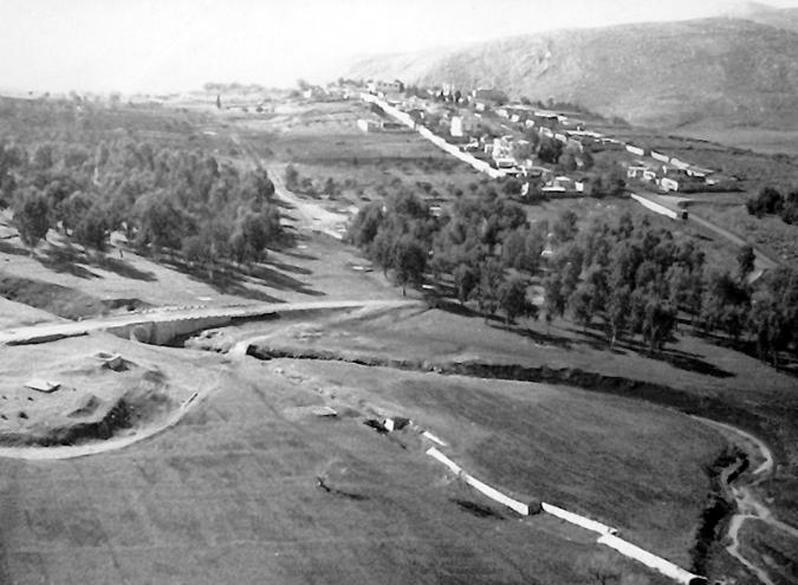 The operation surrounding Damiya Bridge, which connected the city of Shechem (Nablus) with Jordan, was more complicated. The explosives and the twelve soldiers were mobilised to the site in a truck all the while disguised as workers. The truck stopped some two kilometres before the bridge and the soldiers exited it under the guise of trying to fix "the broken down truck". While this happened, a small team made its way to the bridge, placed the explosives, ran a fuse and lit it as they ran away. For some reason the bomb did not explode and the Palmach unit left the site with their mission a failure. Word of the attempt reached the British and a small unit was sent to diffuse the bomb in the morning after, a hidden mechanism placed inside the bomb went off the moment it was tampered with and both the British officer and the bridge exploded. But, the most complicated of all the bridges was "Allenby Bridge" which crossed the Jordan River east of the city of Jericho, connecting the major cities of Jerusalem and Amman. The bridge was well guarded by soldiers both from the British forces and from the Arab League. The six soldiers from the 4th battalion of the Palmach took part in the operation to blow up the bridge. The operation began by blocking the road leading to the bridge from Jericho and cutting the phone lines. As they reached the thick bushes lining the banks of the Jordan River the guards of the bridge opened fire on them. While under massive fire the demolition team slowly made its way to the bridge, eventually arriving and placing the explosives beneath it. The bridge was blown up and the soldiers all withdrew in the direction of Kibbutz Ramat Rachel in the vicinity of Jerusalem. The bridge itself was closed to traffic for three months after it was destroyed. The southernmost bridges to be destroyed in the operation were the railway and road bridges crossing the Gaza Stream into Egypt. Here too the forces managed to place the explosives under the bridges while being barraged with heavy fire. One bridge was completely destroyed while the other suffered severe damages. All in all the operation was dubbed a success and the damage was estimated at some £250,000. For a period of time Palestine was disconnected from all its neighbouring countries and the British came to understand that the Jews in Palestine had built a substantial force that was fully capable of disrupting their plans. But retaliation was just around the corner. Immediately after the operation the British began searching for the perpetrators. Searches were undertaken in Hanita and Matzuba, where the British suspected those who bombed the Achziv bridge came from, similar searches were also conducted in Beit Ha'Arava for those in charge of bombing Allenby Bridge and in Kfar Gil'adi for those who were responsible for the bombing of the bridges by Metulla. Two weeks later, on Saturday 29 June 1946, the cities of Jerusalem, Tel Aviv and Haifa were put under siege by the British forces in Palestine as they searched for the commanders of "Operation Markolet". The British called this action "Operation Agatha" and began a country wide search at all the Haganah centers in Palestine. Based on previous information, Kibbutz Yagur, near Haifa, was thoroughly searched and one of the main arms caches of the Haganah was found in the Kibbutz, from which over 78 guns, 100 mortars, 300 rifles and 400,000 bullets were confiscated. Captives, Operation Agatha. 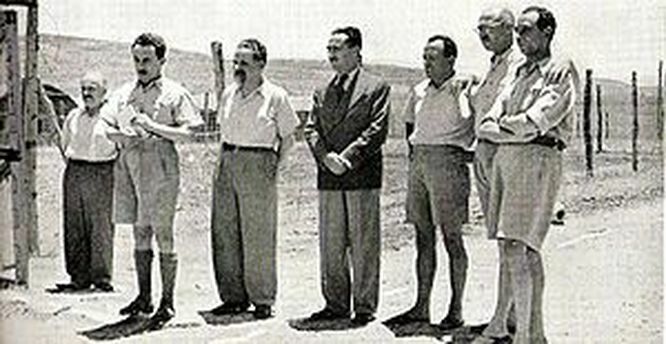 (Moshe Sharet, second from left). Information papers regarding the Haganah personnel was found and confiscated in Kibbutz Mizr'a. The leadership of the Haganah feared bloodshed and commanded to resist the searches passively, this did not stop some individuals from trying to actively hinder the searches leading to three dead Haganah members from Kibbutz Tel Yosef and 'Ein Harod. All in all, and some 17,000 British soldiers took part in "Operation Agatha". Over 2,700 people were arrested and sent to detention camps in 'Atlit and Latrun, among them high standing men like Moshe Sharet (Second Prime Minister of Israel). David Ben-Gurion was spared an arrest as he was abroad at the time. Following a request from Haim Weismann the Jewish Resistance Movement withheld all retaliation plans. The head of the Haganah, Moshe Sneh, resigned from his position and the separatist sect of the Haganah, called "Etzel" commenced, less than a month later, on 22 June 1946, to blow up the southern wing of the "King David Hotel" in Jerusalem, killing 91 people and wounding 46. This action effectively brought an end to the Jewish Resistance Movement due to an inability to overcome the differences in approach between the Haganah leadership and the separatist groups of the "Etsel" and "Lehi". ​Gilad is a historian and archaeologist.